£200 off its normal price. You might want to grab this one while it's hot, as Amazon UK currently has a Nvidia GeForce GTX 1080 graphics card for just £406, which is nearly £200 cheaper than what these kind of cards usually go for. There are only five left in stock for the PNY GTX 1080 XLR8 OC, which has a base / boost clock speed of 1708 / 1848 MHz, up from 1607 / 1733 MHz on the reference card. So it's a nice little overclock, and this card has three fans to keep things cool. Even if these go quickly though, there are two other GTX 1080 models from the same seller, both for under £450. One is a Founders Edition for £477, and the other is a standard XLR8 model for £442. In fact, these GTX 1080s are actually cheaper than some of the GTX 1070s from the same seller right now! Considering the cheapest you normally find GTX 1080s is well over £500, and often closer to £600, these are excellent deals. 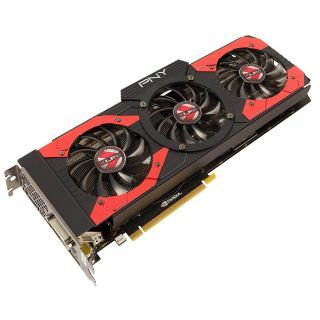 The PNY GTX 1080 XLR8 OC edition which is up for £406 is usually found hovering between £600 - £670 according to CamelCamelCamel, and this is certainly the cheapest the card has been seen for, so we don't know how long this deal will last. The GTX 1080 is the most powerful consumer card around at the moment, and the main reason we like the GTX 1070 better on our list of the best graphics cards is because of the price. This deal shakes things up a bit.